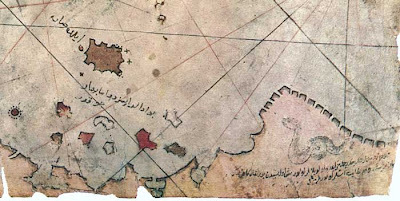 Piri Reis 1513 World Map, Detail. In our post on Unicorns, (Here), we mentioned Turkish Admiral Piri Reis' 1513 map. We also mentioned it regarding Dog headed people (Here). Today we will look at another strange creature that is depicted on that map: a giant snake. The map, in its lower left area (see it Here it is inside the red line) shows a thick coiled snake. The image above enlarges that area of the map. This land is uninhabited. Everything is in ruin (barren?) and it is said that large snakes are found here. For this reason the Portuguese infidels did not land on these shores and these are also said to be very hot. If the latitude is correct (there are several interpretations as to what part of America is shown on the map), the area where the snakes live could be a part of Patagonia. Clearly the "very hot" land is not a good description for Tierra del Fuego or Antarctica. Yet it could be a part of northern Patagonia, which in summer can get to be quite hot (nearly 40°C - 104°F). Maybe this indicates that, at least until the 1500s, there were large snakes in Patagonia. (Read more about giant Patagonian snakes in my post Here). Dutch, S., (1997). The Piri Reis Map. 10.04.2007. Online, Here. Afetinan, (1954). The Oldest Map of America Drawn by Piri Reis. Ankara: Harita Umum Múdürlïigfj Press.